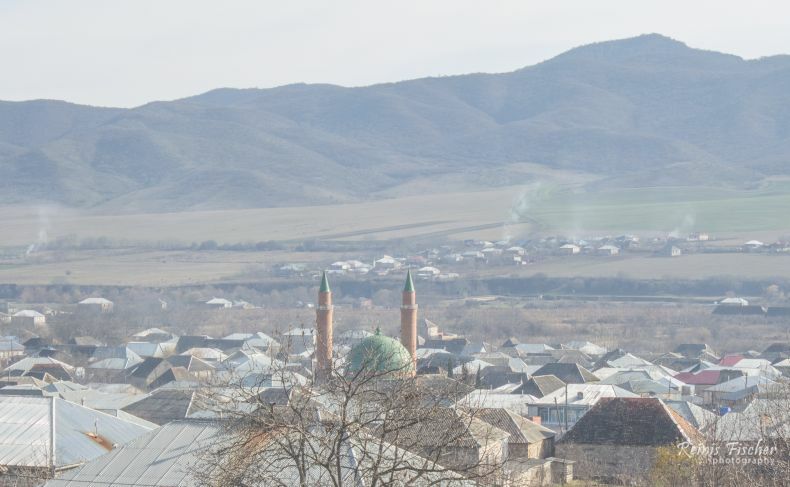 There is not much information available online about Kvemo Bolnisi mosque in Georgia, except that the construction of the Mosque in Kvemo Bolnisi village started in 2005 and ended in 2007. The Mosque started functioning the same year. It was in the mid-December 2018, we were on a day trip to the Bolnisi (and surrounding area), after making stops at Bolnisi Sioni and Tsughrughasheni Church we discovered a green roof mosque. Unfortunately this time we didn't visit the mosque, instead, I took just a very long distance photo. There are two major Muslim groups in Georgia. The ethnic Georgian Muslims are Sunni Hanafi and are concentrated in the Autonomous Republic of Adjara of Georgia bordering Turkey. The ethnic Azerbaijani Muslims are predominantly Shia Ithna Ashariyah and are concentrated along the border with Azerbaijan and Armenia. Islam in Georgia was introduced in 654 when an army sent by the Third Caliph of Islam, Uthman, conquered Eastern Georgia and established Muslim rule in Tbilisi. Currently, Muslims constitute approximately 9.9%of the Georgian population. According to other sources, Muslims constitute 10-11% of Georgia's population.